I found out the hard way that not finishing on time or making a mess is not the only crime you have to worry about with a home contractor. I had the unfortunately experience of hiring a handyman who came back a few days after he finished a painting job to burglarize my house, making off with about $40,000 worth of jewelry and other valuables. So I was not surprised when I read that when home services app SERVIZ put applicants through a pre-employment background check, they discovered that as many as a third of home contractors had prior criminal records. Concerned at these numbers, SERVIZ then researched and assembled its groundbreaking new Home Safety Rankings (HSR) Index for over 100 metropolitan areas across the U.S. It’s a comprehensive look at statistics and findings on home safety across the U.S., with participation from the National Crime Prevention Council (NCPC) and other national organizations. The list ranked cities according to highly specific home safety and crime statistics, and the results included more than a few surprises, with cities in the Los Angeles, Dallas and San Diego metro areas appearing in the top 10 safest, and with multiple cities in the Phoenix, Los Angeles, Denver and other metro areas also falling in the bottom 10 as the least safe. In addition to the nationwide rankings on 108 cities, the HSR examined the home safety habits and concerns of residents through city page infographics. The study shows homeowners vital facts about their city’s potential safety and offers important statistics and tips, with insights on such cities including Los Angeles, San Diego, Phoenix, New York, Washington D.C., Denver, and Austin. The study found that Los Angeles’s Home Safety Score was C+, San Diego scored a B-, New York scored a B, and Washington D.C. scored an F. New York ranked 27 (100 is safest) on the Crime Index, with 40,599 annual crimes, while Los Angeles ranked 19, with 121,241 annual crimes. Washington ranked 3 on the Crime Index, with 39,966 annual crimes. Shockingly, a person’s chance of becoming a victim of a crime is 1 in 33 in L.A., 1 in 41 in New York, 1 in 17 in Washington D.C., 1 in 39 in San Diego, and 1 in 35 across the U.S. (Average). What is even more concerning is that people nationwide are actually unsuspectingly letting criminals into their homes. SERVIZ found that home service pros failed SERVIZ background checks a rates as high as one in nine in Los Angeles, with as many as 1 in 6 carpet cleaners failing checks. One in six handymen in New York and San Diego failed criminal background checks, and one in four home repair pros failed background checks in Washington D.C. The statistics may be frightening, but much less terrifying than coming home to a broken window screen and all your jewelry gone and your home ransacked, like mine was, so be smart, and only hire through a verified service that does a thorough criminal background check. Even if the weather outside is frightening, you can enjoy nature indoors with the warm, soft light of a candle flame and nature-inspired fragrances from the Heritage Collection by Chesapeake Bay Candle ($15-25). These stylish, modern designed candles can make a home feel cozy, homey and romantic with an array of soothing, energizing and refreshing scents naturally crafted with essential oils Available in small and large jars, two- and three-wick coffee table jars and diffuser styles in 12 scents. Available at chesapeakebaycandle.com, Target, Amazon and major home good stores nationwide. Give a good night’s sleep to someone you love with bedding from B Your Bed. This affordable line of luxury bedding includes extra-long bedding to accommodate thicker mattresses and bed toppers. Not only are the fabrics ultra-comfortable, all B Your Bed products carry a seal that ensures consumers that the bedding is made with verified high-quality materials, and the company guarantees the dimensions, thread counts, fill rates and materials meet specifications. The beautiful styling and patterns of these comforter sets and accessories make you never want to get out of bed, hence the company name, that promises those who sleep engulfed in this comfort being will be one with the bed. Available at www.byourbed.com. No smartly decorated home these days can be without a smart voice-activated speaker, not just to play music but to operate all the smart devices in the home, like light bulbs, switches, window blinds, thermostats, and TVs. The 808 Audio XL-V premium smart speaker ($129) is a new entrant to the Alexa-responsive speaker systems, that works in concert with Amazon’s Alexa app, enabling the 808 XL-V to access music and book libraries on Amazon, as well as other streaming services – and it has the ability to stream the same music from another 808 XL-V simultaneously, in other rooms. It can also connect via Bluetooth to stream audio from other Bluetooth-enabled devices or serve speaker for non-Bluetooth and non-smart devices using an aux in jack. 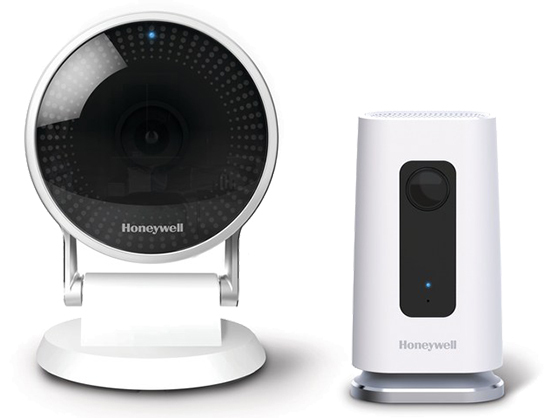 Give the gift of peace of mind to yourself or love ones with the Honeywell Lyric C2 Wi-Fi Security Camera ($169.99), an easy-to-install and use security system that keeps on eye on your home while you’re away, or inside. Using the Lyric app on a phone or tablet, the C2 streams live video and records using free secure cloud storage (up to 1 GB) and 8GB SD-card storage for back-up, so that you can download surveillance clips from the past 24 hours. The system features voice control capability using the Alexa app, sound detection, night vision, and an HD 145-degree wide-angle view that captures video in sharp 1080p high definition. A freshly vacuumed carpet gives the impression of a clean and well-groomed home, and with iRobot’s Roomba, a home can have that just-vacuumed look all the time. 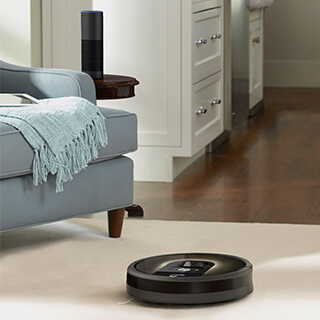 The original and most tech-forward of the automatic vacuum brands, Roomba has developed an army of round robots designed for a variety of carpet and floor surfaces, with its most advanced units, like the w-fi connected Roomba 980 ($899), featuring smart technology that allows Roomba to be operated and programmed using an app or with voice- command devices like Echo or Google Home. While Roomba doesn’t do windows, it’s a great helper around the house that won’t complain about chores, and with its endearing Jetson-esque robotic voice, Roomba may just become your next pet, that picks up fur instead of shedding it. “I don’ like massages,” said nobody, ever. It’s true, everyone likes to get massages, so make everyone feel good right at home with HoMedics Fold-Away Massaging Shiatsu Lounge Chair ($399). 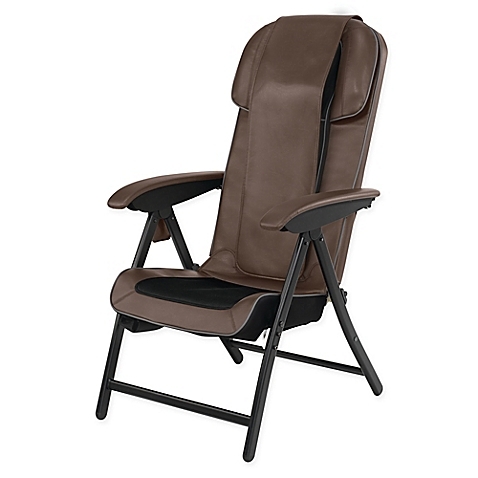 Sit back and relax while this comfy no-assembly-required lounge chair kneads the neck, shoulder, back and legs in an immersive deep-kneading shiatsu massage experience, with an option to apply soothing heat, all controlled with a programmed remote. The seat adjusts for different height levels and features three massage zones that concentrate on different areas, so every family member can enjoy a massage to their liking. When not in use, the chair folds compactly for easy storage. Available online at Bed Bath & Beyond or at store locations. 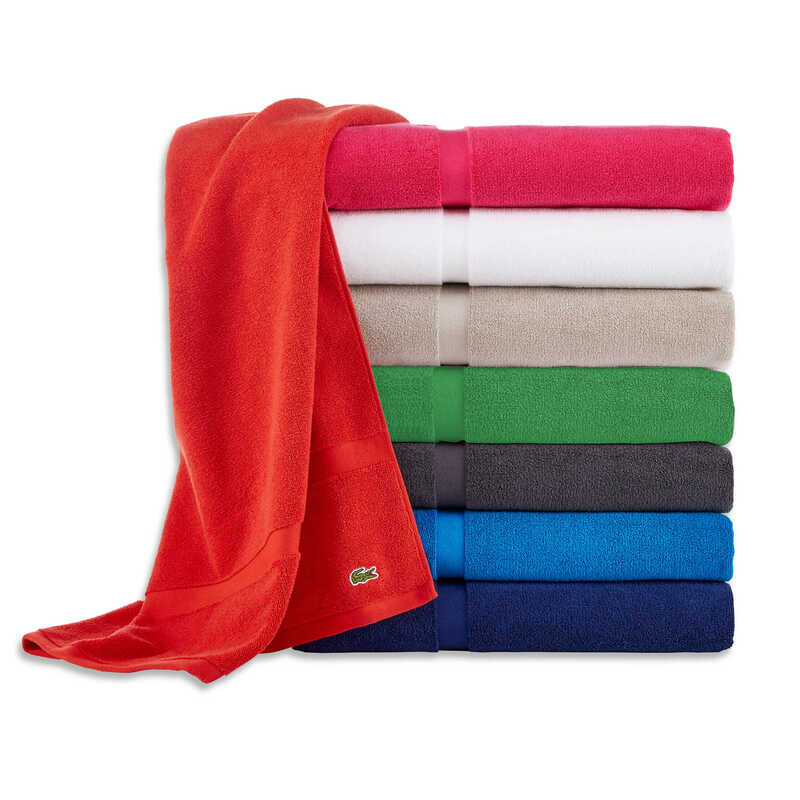 Refine and refresh the look of any bathroom with the modern style and rich colors of bath towels from the Lacoste Court Bath Towel Collection ($17.99). These thick and absorbent towels are crafted of high quality and durable soft 100-percent Supima cotton, with luxurious fibers that offer a beautiful luster and a design that features Lacoste’s signature croc patch. The colors from the towel collection complement the full collection from Lacoste Home, in case you want to wrap up on a matching bath robe. Making a skateboard at home is very easy it’s not like a rocket science. Some people feel it’s difficult to make a home but will tell you it is straightforward to make. Anybody can make it at home with a little patience and little knowledge of carpentry work, vacuum press, glues and other materials. Hard rock maple wooden board. Three high-quality skateboard veneer glue. The first most important thing to make a skateboard at home. first you have to buy a hard maple not other types of maple like oak and pine because this kind of material is stiff, strong enough and it can’ break easily. Face – this kind of veneer is sanded from one side and not sanded from another side. Cross Band – This sheet of veneer is cut with grain but not cut against gain. Core Layer- This type of sheet is same like a face, but a difference is that it is both sides of veneer is not sanded. Once you have all types veneers now next step is to apply glue on it. Tiebond glue is best for this. Then you can need of screwed on board. Use glue on all side first Apply glue on the unsanded side of a sheet and unsanded side and then apply on the face of a core layer. Once you apply glue on all faces of veneer now, it’s time to make pressure on it. Take two pieces of cardboard about 3 inches long and put the veneer in between mold and cardboard. Next to take 4 channels irons with 20 inches nuts and washers. Tight a channel iron in the center of a mold so to give a tight press. Once this step is done, let it take shape for about one day to make a hard and stiff. Designing the uncut after rest one day take it out from a mold and remove the piece cardboard. One you unmold it next step if make your design on it. You can use your creativity or use a cadd program for embossing nose to tail and can draw your design on graph paper. But don’t apply a tape on it once your design is not complete according to your choice. Once everything is complete marking for trucks position, and you can start to apply a tape and cut the outlines. Once you do this all process the next step to use a band saw because it is a more accurate technique to cut, but if you not have you can use a handy dandy little jigsaw. After cutting is done take a router rasp to curve edges. Then apply sand paper on it. Trucks: this is large metal pieces that hold your axle and attached to wheels. Bearings: it allows to move your wheels smoothly, and it comes in steels and ceramics. Wheels: the central part of skateboard there is a wide variety of wheels available in a market. After applying all these on board, your skateboard is almost ready. At last, you can design a logo and other painting according to your choice. Now your skateboard is ready to ride. Many a travel-weary soul has exclaimed, “There’s nothing like being home in your own bed.” Your bedroom is your private sanctuary, so make it an inviting place where you can rest, sleep and feel restored, surrounded by pure comfort and beauty. Bring a lasting bouquet beauty of seasonal blooms into your bedroom with Ted Baker London floral bedding. The designer known for its rich, vibrant hues and elaborate prints is launching a new line of luxury linens for spring, including the Blue Beauty collection, inspired by souvenir photographs taken by the designer on a bicycle ride around Holland’s tulip fields. The tonal blues create a striking statement against a pristine white backdrop. The soft 100-perfect cotton comforter sets, coverlets, and decorative pillows are available at Nordstrom.com, priced between $65 to $285. Sleeping in total comfort not just a dream. PONS bedding has made it their mission to create the ultimate environment for perfect sleep. The PONS mattress (starting at $599) will help you rest well not just because of its gel infusion for cooler sleep, its breathable knit cover for airflow and its body-conforming foam with three levels of pressure point relief for restful shuteye, but you will sleep well knowing the materials under you are 100-percent eco-friendly and CertiPUR-US certified from head to toe. The mattress contains no ozone depleters, mercury, lead, and other heavy metals, or formaldehyde or phthalates, and low VOC (Volatile Organic Compound) emissions for indoor air quality (less than 0.5 parts per million). PONS made the perfect match to its mattress in a bedframe ($1,199) equipped with USB ports for recharging while you sleep. Soon PONS promised to offer cooling and ultra-dry sheets, comforters and pillows. Nature’s bounty of trees, plants and flowers, as well as our beloved animals, bring us beauty and joy that make our house a home, inside and out; but they also bring into the home pollen, dander and other indoor pollutants that can be harmful to our health and comfort. Blueair Classic 405 ($599) air purifier filters out the polluting particles to clean unhealthy air in your home environment. It operates quietly, and its modern design discreetly blends in with home décor. Integrated smart technology allows it to be operated remotely with a smartphone. The clean-air companion to the Blueair air purifier is Blueair Aware ($199), a sleek, small air monitor that continuously measures indoor air quality and quickly detects airborne pollutants, including ultrafine particulate matter (PM2), volatile organic compounds (VOCs) such as formaldehyde and benzene and carbon dioxide equivalents (CO2). You don’t need to know what any of these chemicals and contaminants are – just that when the Blueair Aware indicator shines blue, the air you breathe is A-OK. If the indicator light turns orange, it’s time to shut the windows or eliminate other sources of air contaminants. Feeling good under the covers begins with a fresh, clean bed and pillows. Cover your mattress and pillows with an allergen-barrier to keep down dust mites, pollen, pet dander and other household allergens. AllerEase Ultimate zippered mattress protector ($55.99) and pillow protectors ($9.99) fully encase mattresses and pillows in antimicrobial, hypoallergenic fabric to reduce exposure to irritants; and because the top fabric is soft and pliable, the covers do not alter the feel or breathability of your sleep surface. As an added benefit, the waterproof coverings offer protection from spills, and they can be machine washed and dried for easy care. Independence Day is around the corner, so get ready to celebrate in style and spirit. Be a star at your July 4th party with festive food, drink and Americana accoutrement made for entertaining and enjoying your holiday. You can’t miss with a flag themed bean bag toss game. This stars-and-stripes Americana Edition of the popular corn hole game comes with two 24″ x 35″ boards and red and blue bean bags for two or four players, with a built-in compartment to store the bean bags and Velcro fasteners to keep the boards together for easy storage and carrying. Available at TJMaxx for $79.99. Dress in indie spirit with patriotic themed Trucks Surf & Co. swim suit or a R, W & B Life is Good T-shirt ($7.99 – $14.99), available at TJ Maxx. Dress up or dress down with a versatile and comfortable Discovery skort from Royal Robbins ($55), with a zipper pocket, built-in UPF 50+ sun protection, and a wicking quick-dry fabric perfect for outdoor fun, trekking or travel. Keep up the beat wherever you are, with the Yatra Aquatune 5712 ($34.99), a small but booming weatherproof wireless Bluetooth speaker that can jam up to 12 hours on a charge. It’s so compact it can clip on a belt or beach bag so you can bring along the tunes on the go. www.shopyatra.com. What’s more American than apple pie and ice cream? Scoop on the red, white and blue with Turkey Hill All Natural ice cream in pure vanilla bean and new flavors of raspberry chocolate chip and blueberry. Like all 20 flavors in the All Natural line-up, all flavors are made with only milk, cream, sugar, and natural flavors, and they include no artificial colors and no stabilizers. Available at select grocers and convenience stores wherever Turkey Hill products are sold. Rock out while you view the fireworks in a GCI Outdoor FirePit Rocker ($60) that will make you the envy of everyone sitting stiff in their old-school camp chairs. This low-ride spring-loaded rocking camp chair lets you lean back and look up at the fireworks, and for camping it’s the perfect height for an evening around the campfire, with a mesh backrest and padded armrests for cool comfort, and a beverage holder to keep your drink close-by. Available at national sporting good retailers. Keep the skeeters and other pests from biting at your picnic or fireworks party with Nobitech insect-repellent performance wear. Their collection of Skintex-treated T-shirts and long-sleeve pullover sand hoodies ($19-$35) are suitable for the sports-minded athlete but also stylish enough for regular folk and can help ward off Zika-carrying mosquitos and Lyme-disease carrying ticks. Break out the Popcornopolis and make your Fourth of July party really pop. Popcornolpolis chef-designed artisan popcorn one-ups America’s favorite snack food with decadent gluten-free, non-GMO confection varieties like Zebra, drizzled with premium chocolate; Chocolate Stripe carmel corn drizzled with dark and white chocolate; Chocolate Peanut Butter caramel corn; and White Chocolate Macadamia; or try the Popcornolpolis new line of organic popcorn Nearly Naked; Herbed Butter; Three Cheese; Pesto Mozzarella; Avocado Lime; Kettle Corn; Karamel Kiss; and Chocolate Macaroon. Available at Popcornopolis stores, grocery and club stores, sports stadiums, movie theatres and at www.popcornopolis.com. Ginger Beer, and Tonic flavors. If old-school pop is more your style, step up your health game with Zevia’s sodas, naturally sweetened with stevia, exploding with taste in flavors beyond cola including Black Cherry, Grape, Grapefruit Citrus, Lemon Lime Twist, Mountain Zevia, Orange and Strawberry. Invite friends over and chill out with your Little Black Dress on the table. No, not with a lampshade on your head, but with LBD wines. For a refreshing summer wine, try LBD Pinot Grigio, with aromas of apple, melon and lemongrass before a zesty tangerine finish; or for something a bit more complex, there’s the Pinot Noir, with layers of cherry and clove with soft floral notes, hints of strawberry jam and pomegranate; or everyone’s favorite party wine, the LBD Chardonnay, a crisp and fruit-forward wine with flavors of apple and pear, and creamy accents of vanilla and oak. Available in wine stores, bars and restaurants and select grocers including Safeway, Wegmans and Harris Teeter. When America’s poor tired huddled masses come to call on the Fourth, be ready with a little extra seating. Sit in style with Dar Living Folding Stool, in red, blue and other colors. When your guests leave, the chairs fold up compactly for quick storage, and the built-in handle makes for easy carrying. Get the stools in a four-pack ($35) so all your company has a place to rest their laurels. Available on Amazon and home goods retailers nationwide. Just like your Mom told you, even if the sun is behind the clouds, UV rays can be damaging to your skin; but bet she didn’t mention what those rays can do to your vehicle. Sun, heat, salty sea air and other harsh environmental elements can take a serious toll on your car or truck, inside and out, and under the hood. Get your car ready for summer vacation with these DIY maintenance tips. Check your tires. There’s nothing worse than a flat tire on your road trip. Be sure to check for proper inflation pressure, especially since under-inflated tires consume more energy, therefor giving you poorer gas mileage. Protect your car from the sun. Similar to protecting your skin with sun tan lotion, it’s important to shield vinyl, plastic and rubber surfaces on your car from the sun’s harsh UV rays. You can use a product like Meguiar’s Ultimate Protectant, which creates a rich shine & darkness on interior surfaces, while bringing new life to exterior trim, moldings & tires. Wash and wax your car. Your car’s finish can easily fade and rust from the salty air and sunshine. Be sure to give your car a solid wash and don’t forget to wax before heading toward the shore. You can use Meguiar’s Ultimate Fast Finish, the easiest and fastest way to wax your vehicle in just 10 minutes. Simply spray and wipe with a microfiber towel and your vehicle will have a slick, protective top coat that will deliver up to one full year of water beading protection—no buffing required. Clean the underside of the hood. Any salt and grime build-up remaining from the winter months along with added beach salt could harm electrical connections and fuel and brake lines. Spray Nine Heavy-Duty Cleaner/Degreaser can help wipe away bugs, tar and other unwanted hitchhikers on surfaces and can also help control mold and mildews as well as fungicidal growth. It’s hot out there…don’t forget about your cooling system. The last thing you need on your relaxing trip is a problem under the hood. It’s important to inspect your antifreeze/coolant to make sure it’s free of debris and contaminants. If you notice an issue, flush and fill your system with a mixture of 50 percent concentrated antifreeze and 50 percent distilled water. If your reservoir is low, you can easily top off with Prestone® 50/50 Prediluted Antifreeze/Coolant with patented Cor-Guard® corrosion inhibitors. Wipers! Even if you have not used your windshield wipers in a while, they need regular replacing due to dry rot that can make them ineffective when you need them. Rain-X Arch beam blade wipers are a step up from standard wipers as they have a curved design engineered to improve pressure distribution on the windshield and a graphite coating, so that they wipe smoothly and chatter-free, plus they are simple to install with nearly all wiper arm styles.